Father Steven J. Marinucci, 71, is on administrative leave and his priestly duties are restricted after the Archdiocese of Philadelphia received an allegation he sexually abused a minor decades ago. He has denied the allegation, and it is the first of its kind the church has received about him, according to a statement by the archdiocese. Since the priest had been serving at St. Matthew Parish in Northeast Philadelphia as a parochial vicar for about eight years, the announcement about him was made at all weekend Masses there, and counselors were available for parishioners. 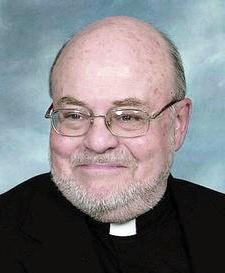 During the time of the alleged abuse in the late 1970s, Father Marinucci served at St. Hubert High School for Girls, with residence at two nearby Northeast Philadelphia parishes, St. Bernard and St. Bartholomew. The allegation of sexual abuse by Father Marinucci was immediately referred by the archdiocese to local law enforcement per archdiocesan policy. He was suspended earlier last week, the archdiocesan statement said. While on administrative leave he will not be able to exercise his ministry publicly, present himself publicly as a priest, or be present in any parishes or schools. After civil authorities complete their work, which may or may not lead to the filing of charges, the archdiocese will launch its canonical (church law) investigation, conducted by the archdiocesan Office of Investigations. It is led by John Delaney, a former first assistant District Attorney for the City and County of Philadelphia. His office also probes matters of alleged activity that is not illegal in nature, but that may violate the Standards of Ministerial Behavior and Boundaries established by the archdiocese. Delaney oversees that work and is the liaison between the Archbishop of Philadelphia and the Archdiocesan Professional Responsibilities Review Board. It was established in 2002 and is composed of 12 men and women, both Catholic and non-Catholic, “who possess extensive professional experience in investigation, prosecution, child abuse prevention, victim services, and the treatment of sexual offenders,” according to the archdiocese. According to archdiocesan procedures, the board receives the results of canonical investigations conducted by the Office of Investigations. The board then evaluates all facts and makes a recommendation to the archbishop regarding an individual cleric’s suitability for ministry so that he can make a decision in the matter. Anyone wishing to report an allegation of sexual abuse, or any other criminal activity perpetrated by a priest, deacon, employee, or volunteer of the Archdiocese of Philadelphia, may contact a local law enforcement agency and/or the archdiocesan Office for Investigations at 1-888-930-9010. That office may also be contacted to report a violation of the Standards of Ministerial Behavior and Boundaries. Victims of sexual violence and exploitation who need assistance and support may find services through the Victim Assistance Office of the Archdiocese of Philadelphia at 1-888-800-8780 or philavac@archphila.org. Father Marinucci has served at the following parishes, schools and offices in the Archdiocese of Philadelphia: St. Bernard, Philadelphia (1974-1978); St. Hubert Catholic High School for Girls, Philadelphia (1975-1979); St. Bartholomew, Philadelphia (1978-1983); Little Flower Catholic High School for Girls (1980-1983); Our Lady of Fatima, Bensalem (1983-1985); St. John the Evangelist, Morrisville (1985-1990); St. Charles Borromeo Seminary, Wynnewood (1990-2000); St. Clement, Philadelphia (2000-2001); St. Agatha/St. James, Philadelphia (2001-2010); St. Matthew, Philadelphia (2010-2019); placed on administrative leave and faculties restricted (2019). Steve and I lived on the same street while growing up. He performing my wedding ceremony, as well as my cousin’s. He then baptized my cousin’s children, and officiated at their weddings, as well. We have known him for a very long time, and his behavior has always been above reproach. He is the LAST priest I would ever expect to do anything inappropriate. While it is understandable that any allegation must be investigated, to plaster his name in news stories before the investigation is completed and before he has the opportunity to defend himself, is simply unconscionable. We are praying for all parties, but I’m confident his name will be cleared, because Steve is a good man and a good priest. He was a wonderful priest who was a sincere and a holy man. He was a great inspiration to my two teenage boys who remember him fondly. I find this allegation very, very suspicious. I played a lot of schoolyard ball with Steve as a kid. I find this VERY hard to believe. I taught for years with Len Peterson and Mike Flood at O’Hara and I didn’t believe the accusations made against them. Kids know and the kids that we taught in common had a lot of respect for both men. That respect was earned. It turns out that Mike and Len were cleared. I feel the same way about Steve. I not only liked him, I respected him. I believe Steve will be cleared. So difficult to believe. Why this allegation after so many years? Lord have mercy on the accuser. I’ve worked with Father Marinucci for several years and always found him to be above board, a good man and good priest. Prayers offered up for him. Father leads others to Christ. It is his call. Perfect or imperfect, he has done well. God has his back. I am sure of it. Father Steve is a long time friend of our family. He officiated my wedding and my sister’s. He is a great person and an even better priest. Our prayers go out to all involved. 45 years of dedication to the Church goes down in flames with an unsubstantiated allegation. There has to be a better way to handle this. Father Marinucci is not deserving of such treatment. He is a wonderful priest and I’m sure many of us will be trying to help him now that his life has been shattered. Let’s start by praying for him. There is no doubt in my mind that Father Marinucci is an innocent victim and that he will be exonerated fully. My concern is that his suffering from this attack could adversely affect his health. We at St. Matthew Church have been deprived of a very good priest. Could this matter, and other similar accusations, be handled in a manner which would protect the reputation of these dedicated servants of God? I agree with Joe- No matter what results from the investigations he’s guilty- IF it turns out he’s completely innocent and his accuser a liar he’s guilty for life and then he’s a victim very few will rally behind- Will we ever see the complete file on this if he is innocent? So sad and so unavoidable if Church leaders in the past had not committed the greatest sin of all. Pride. Their pride led them to believe Christ would be OK with them covering up the sins of their priests to protect His Church. Their pride led them to believe they could get away with it. C.S. Lewis said the greatest prize the Devil can make off with is the soul of a priest. Father married me at St. Agatha/St. James; and baptized my second son. I pray for him, and the one who has come forward. As a former Altar Boy, I had served Fr. Marinucci during countless Sunday Masses, Weddings, and Funerals. My fellow Altar Boys would join him for breakfast, served by one of the staff members, at the Rectory after the daily 6:30 a.m. Masses before heading to school. He was always a positive role-model for the boys/girls and young men and women at St. Bartholomew’s Parish. Stories such as this one break my heart. I know this is not politically correct but where has this person been. Allegations from decades ago. This has been an issue for at least 15 years in the Archdiocese. I seriously question why it took so long. I don’t know this man nor do I know of his innocence or guilt but I’m suspicious these commercials being run on tv by an ambulance chasing law firm might have something to do with it. I agree with Joe. That add just shakes loose real/imagined episodes of 40-50 years ago which will never be resolved and the accused goes down in flames.Fr. Marinucci is a good man and a good priest. May God continue to bless you Father Marinucci. Love, all the members of St. Bart’s that you helped and mentored through the years. Just doesn’t sound like the priest I knew back at that time. Did so much good for our parish. And for me personally. Fr Marinucci has had a long and fruitful ministry. His assignments were long ones which makes me suspicious of the allegation. Like any other American Citizen. Due process of the law. Presumed innocemt until proven guilty. Like anyone else. Very shocked to hear of the allegation. I Remember all the fun events at St Bart’s and I personally spent time with Father M on several occassions and never experienced any inappropriate behavior. Hopefully this will be resolved for all involved. I was in 7th grade when Fr Marinucci came to St. Bart’s…he was a positive and caring role model and truly cared about the kids. He is the one who started the CYO at the parish…I considered him a friend…this breaks my heart to read this.